1. Consider the continuity of actors in their positions on set. In many scenes, actors are blocked to walk to a part of the set, pick up some prop and deliver the dialogue. For example, an actor opens a car door and then has an exchange with another actor in the scene. In all too many productions, the continuity folks and the director don’t keep an eye on this. Sometimes the line is delivered before the door is opened – sometimes afterwards. As an editor this may limit your options. Maybe the best delivery is on the master shot when the door is closed, but the best version of the medium shot is with the door open. You need to pay attention to these conditions and try to make them work. Either use only takes where items match – or use the best performances where continuity doesn’t match – but then figure out a way to cut around these errors so the audience doesn’t notice. 2. “Stammering” and forgetting dialogue. Actors all have little devices to help remember lines or to cover up when they forget a line of dialogue. Sometimes this takes the form of a hesitation, an “um” or an “ah”, a small stammer of a word or two, or the repeat of a phrase or a line. Your job as an editor is to help make the actor look believable as that character. As such, you need to be aware of these tricks and mistakes and take them out whenever necessary. Of course, sometimes they are an intended part of the acting, so make sure you don’t edit out the wrong thing. Removing these means covering the edit with a reaction or another angle, but this is all part of shaping a performance. 3. Expanding or contracting scene pacing. Editing has to do with pacing, but this is more then just setting a rhythm. Pacing has to do with adding tension or speed. Removing or reducing empty pauses in the dialogue between two characters – even overlapping lines – adds a sense of agitation or excitement. Inserting extra pauses between lines adds a sense of tension between the actors. Each long pause becomes slightly uncomfortable as would be the case in a painful conversation in real life. 4. Remove “shtick”. Often actors will be allowed to ad lib scenes or the director decides to inject some humor into a scene. Sometimes this works, but it typically comes across as overacting – especially when the film isn’t a comedy. Be judicious, but it’s often better to go with the understated performances, because they appear more genuine. 5. Motivation for actions. When an actor listens for something or looks in a certain direction, the audience needs a cause for motivation. This could be an off-camera sound, like a car horn honking, or it could be an insert shot of what the character sees. It’s important to try to find these shots or to ask that the director shoot them. In the case of sound, pull temporary sound effects to place into the edit. 6. Profanity. Often when actors are allowed to ad lib lines, they’ll toss in a few expletives for emphasis. Some folks see this as normal language and others as offensive. If you have an editorial choice, opt for the take without the profanity, unless that’s what the director specifically wants in the cut. If you can edit it out, do so. Sometimes, it’s possible to use the line, but cut it as a split-edit, so the expletive is delivered over a cutaway. In other words, you don’t see the actor actually delivering the word. This makes it easier to remove at some point in the future, should a “sanitized” version be required by the producers. 7. Intercutting parallel character action in a scene. A scene is often more interesting when you see what the rest of the actors are doing. As you review the takes, notice the performance each actor is bringing to the scene during the parts where he or she isn’t delivering the main dialogue lines. Try to incorporate some of these as reactions and cutaways to spice up a scene where appropriate. In other cases a character must move from one part of the scene to another. If they are integral to the scene, it helps to include a few shots that let the audience know what is happening. For example, you don’t want a character to apparently pop into the foreground to suddenly deliver a line, when the last time the audience saw them was still inside a car at the beginning of a scene. You need to include a few shots, as the scene progresses, that clarifies to the audience that the character exited the car and started moving closer to camera. Then it’s natural when they deliver their line. 8. Intercutting transitional action. Sometimes scenes, as written, don’t transition well between each other when cut into a movie. For example, you might have two scenes back-to-back, in which each scene is a driving shot with a different set of characters talking to each other in a car. If Scene 1 ends and abruptly cuts to another similar scene in a car again, this won’t feel smooth. Instead, pay attention to transitional elements – for example, additional footage of driving or a POV from the car. These can be used to open time between the two scenes, just to give the audience a moment to breathe and make the mental switch. Another technique in this situation could be to intercut the two driving scenes, so that sections of Scene 1 and Scene 2 are interleaved into a single scene going back and forth. Again, POV shots and general driving B-roll, plus some openness between the two situations, helps the audience make a seamless transition between these two disparate elements. 9. Use all the pieces. 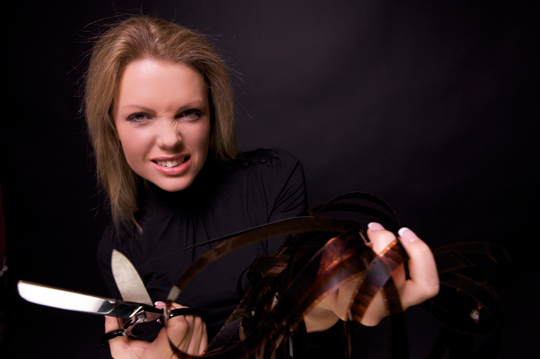 When you cut together a scene, don’t simply rely on the selected take as your best and only choice. Perhaps the “circle take” was only noted because it’s the only complete take where the actor got all the way through the scene with a moderately good performance. Possibly Take 1 had the best opening lines and another take the best middle and yet a different take had the strongest ending. As an editor, your job is to mold the scene by using all the elements at your disposal – in order to put on screen what the script writer and director intended. This includes reaction shots and cutaways to bridge the edits that are necessitated by such a patchwork of performances. Yes, it’s called editing, but in reality you are constructing, not merely removing. 10. Let your assistants cut. Unfortunately, I’ve rarely had the opportunity of working with assistant editors who were more than media loaders. On this recent project, I had a very sharp assistant who was also capable of editing. I wasn’t under a tight schedule and we were cutting as they were shooting, so the director was away on location. This provided an ideal opportunity to let my assistant cut a few scenes. I’d review and suggest tweaks, but the scenes were his. In the end, this will give your assistant a chance to grow, but better yet, it gives you as the editor an additional perspective as to how someone else sees that scene. One of the TV season’s brightest new arrivals was HBO’s medieval fantasy series Game of Thrones, an adaptation of the popular novels by author George R.R. Martin. The TV series, created for HBO by David Benioff and D. B. Weiss, debuted April 17th and was honored as Outstanding New Program at the 27th annual Television Critics Association’s TCA Awards in Los Angeles. The series was also picked up for a second series two days after its premiere episode aired. Shot mainly in Northern Ireland as well as Malta, Game of Thrones made extensive use of digital effects including massive digital set extensions, all created by BlueBolt Ltd in London; Screen Scene Post Production in Dublin, Ireland also did half the visual effects for the series. Also key to the series’ look was production designer Gemma Jackson, art directors Paul Inglis, Thomas Brown, Ashleigh Jeffers, Tom McCullagh and Steve Summersgill; set decorator Richard Roberts and costume designer Michele Clapton. The main cinematographers for the show were Alik Sakharov and Marco Pontecorvo who did camera and grading tests with colorist Gary Curren at Screen Scene Post Production, who used the Nucoda Film Master. The grading tests were not only used to help the cinematographers choose set-ups, but also influenced HBO executives to pick the ARRIAlexa camera, for its image quality and, in part, because of the camera’s tight integration with the Nucoda Film Master. To handle an intense workflow of constantly updating visual effects, Screen Scene created a workflow based on itsRorke SAN. Linked to the SAN was an Avid DS system for online finishing as well as the Nucoda. The Alexa 4:4:4 material was captured to HDCAM SR tape; the Screen Scene crew received an EDL, loaded up the tapes and pulled footage as DPX files to the SAN. Next, they shot-checked on the Nucoda Composer and then handed off the resulting EDL to Curran who relinked to the same media, pulling it from the SAN, for grading. With regard to the use of HDCAM SR tape, Curran notes that production took place before the tsunami. “Once we got into post, tape did get scarce, but we had enough in reserve to keep going,” he says. Curran also notes that Season 2 of Game of Thrones will go tapeless. “What happened with the Sony factory pushed them in that direction,” he says. HBO has not yet announced where the show will post for Season 2. Last week Steve Jobs stepped down as Apple’s CEO. Sad times, but I’m sure Apple will keep going strong with Tim Cook at the helm. I’ve collected some of the best recent posts written about Steve Jobs and Apple. Enjoy. 3. Steve’s New Role at Apple: What Does the Board of Directors Do? 9. Seriously, What’s Up with the “i”? One more thing… I for one look forward to reading Steve Jobs autobiography (Out this November) which I’m sure will be an interesting read. Goodbye Mr Jobs, enjoy a well earned rest. Much has been made over the connection between JJ Abrams, director of Super 8, and his hero – and Super 8 producer – Steven Spielberg. Both view the world like wide-eyed, overgrown boys, and in their most beloved work (Abrams’s Lost, Alias and Star Trek; Spielberg’s ET and Close Encounters of the Third Kind) blend the wonder of the supernatural with the tender harvest of the human heart. Coincidentally, both also kicked off their film careers at the age of 12 by making 8mm home movies. Spielberg was after a Boy Scout photography merit badge, while Abrams’s focus was his lifelong obsession with special effects. “What I loved about special effects was the magic of it,” Abrams tells me. We’re sitting in the soft-focus, mumsy luxury of a beachside hotel suite in Santa Monica, French doors thrown open to the late afternoon Pacific breeze. 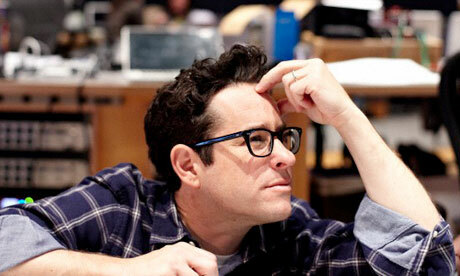 The 45-year-old director-writer-musician (he has composed the themes for many of his TV shows, including Lost, Felicity and Fringe) is dressed casually in jeans and wearing black intellectual-nerd glasses, his wavy black hair a skybound thicket, as if perpetually charged by the intensity of its owner’s convictions. “When I was a little kid – and even still – I loved magic tricks. When I saw how movies got made – at least had a glimpse when I went on the Universal Studios tour with my grandfather, I remember feeling like this was another means by which I could do magic. It wasn’t the guy with the top hat and the rabbits, it was a way of creating illusions that something was real that wasn’t. It could be a time and a place, it could be a weather system, it could be an aeroplane flying through the air, it could be a creature that wasn’t really there, a fight scene, blood splattering, window breaking, fire – it could be anything. All these things were little magic tricks, and the idea that they could all add up to create the illusion that something was real, so that people would have an emotional reaction to the relationship, a circumstance, an event – that was very exciting to me. I can see Abrams getting lost in the question – in every question during our conversation – furrowing his brow and looking down into a middle space as he formulates his response, his answers picking up steam after an initial hesitant launch, until his words spill out in a salvo of emphatic zeal. He’s a fast talker. 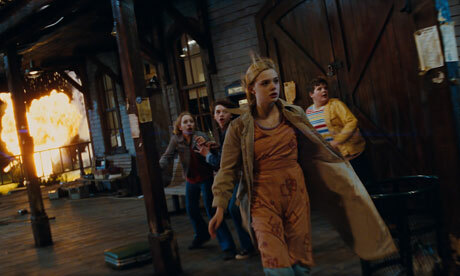 Terrifying, funny and transportive are apt descriptors for Super 8, Abrams’s first film as both director and writer. Using his adolescent auteur experiences as the jumping-off point, the story follows a group of children in the summer of 1979 as they set about making an 8mm zombie film. Our hero is Joe, a 13-year-old struggling with his mother’s sudden death in a factory accident, while he assists his friends’ film by designing monster makeup and exploding model trains. But curiously, Super 8 is not the first time Abrams has worked for his hero. When he was a teenager, he was profiled in a newspaper article about his participation in a young film-makers’ festival in Los Angeles. In a coincidence straight out of a movie, Spielberg read the article and hired Abrams and a friend to repair some 8mm reels that he had knocking around from his own teenage movie-making days. Abrams’s mother Carol has described her horror at finding the spaghetti pile of Spielberg’s unspooled films blanketing the floor of her son’s bedroom. “What have you done?! ?” she’s reported to have screamed. “He’s going to sue us! We’re going to lose our house! We’re going to lose our cars!” Fortunately for both the Spielberg archives and Abrams’s future in Hollywood, young JJ finished the job and split the $300 fee with his partner, though he had yet to actually meet the famous director. Even the casual cineaste will be able to connect the dots between Super 8 and Spielberg classics ET, Close Encounters of the Third Kind, Jurassic Park, even The Goonies. I wondered if Abrams had struggled to avoid quoting Spielberg on the master’s turf of emotional, child-oriented sci-fi, or if it was a deliberate homage. “I’d called a guy who had a production company called Amblin, who made a bunch of movies that I loved [when I was] growing up and still love now, and when you’re working with someone who inspires you in a certain way, that’s part of the fun of it. “Super 8 is about kids in 1979 who are the age that I was at that time, and I was massively influenced by Steven’s films. What made perfect sense was not: ‘OK, let’s ape his movies and start copying things,’ but let’s make a movie that feels like it belongs on a shelf with other Amblin movies. What about the decision to set Super 8 in 1979, before the onset of the internet and instant YouTube stars? “The idea of doing a story about a bunch of kids now making a movie on an iPhone has no interest for me whatsoever,” Abrams declares. “Part of this was about an era where, if you were that age, making movies, you were an oddball. Not every kid had a camera the way they do now, on their phone. It meant effort, because you had to consider: ‘Well, I only have so much film, so what am I gonna film?’ You couldn’t just record over it. You had to make a choice. Was there pressure to come up with a terrifying monster for Super 8, given Abrams’s early focus on special effects? The talk shifts to Lost, and Abrams’s continued fascination with magic – in this case, the magic that occurs when an audience’s engagement with a show turns it into something bigger than originally conceived. In addition to the premiere of Super 8, Abrams has a full platter of projects: the Mission: Impossible film he’s producing; the upcoming TV shows, Alcatraz and Person of Interest, which he is consulting on; Fringe, the ongoing supernatural thriller series; as well as a comedy series he is developing – a new direction for him. And then there’s the next Star Trek film, which he’s keen to direct (“The idea of someone else saying ‘action’ to those actors in those characters on that set makes me jealous,” he says), though nothing is decided. The arrival and subsequent feeling of disappointment with FCP X has left a vacuum in the editing world, who can fill it?When Apple called a hurried press conference at this year’s NAB Broadcasting Conference in Las Vegas there was the usual feeling of excitement over an Apple announcement but also a question over the impromptu style of a major editing product launch – the announcement had to be to do with the next version of Final Cut Pro. When FCP X was finally shipped a couple of months later and received so badly by so many professional editors Apple’s editing competitors must have felt that their moment had arrived. Competitors like Adobe and AVID who both very quickly conjured up ‘unheard of before’ conversion discount deals from FCP to their editors Premiere Pro and Media Composer. They also both made comments directly referencing the FCP X product release. Canny and charming Adobe General Manager Jim Guerard was perhaps making a slight reference to the unhappiness with FCP X from the industry when he said, “We are hearing from video professionals that they want pro level tools that address cutting edge work but also allow them to use legacy footage and workflows”. The Adobe deal is that if anyone wanted to switch from any version of FCP they would be eligible for a 50% saving on CS5.5 Production Premium or Premiere 5.5. The UK price of Premiere Pro 5.5 is around £700 against £199 for FCP X and Avid Media Composer 5.5 at around £1800. Making Premiere Pro 5.5 with discount in reaching distance of Apple FCP X.
AVID were more picky and only offered a deal if you hadn’t bought FCP X. But the discount was much more. You were and still are able to buy Media Composer 5.5, with the Production suite and free online training for £699! About 60% discount. Paul Foeckler, vice president, creative professionals products and solutions for Avid commented, again referencing the Apple release. “Users who may be facing uncertainty now also have access to a Mac OS native industry-leading editing solution from Avid – a company that is dedicated to listening to their needs through our commitment to openness, collaboration and innovation in professional editing workflows.” Ouch! Adobe already have a shoe-in big budget feature film to use as further evidence of their ascendancy with the new Godzilla film directed by one man band film maker Gareth Edwards who used the entire Adobe suite of programmes to make the hit Monsters and will again with the new adaptation of the classic monster film. Anybody who has bought Adobe software knows that their pricing encourages you to buy the suite of software and not just the individual software products. This is where Adobe might have missed a trick as many post production creatives feel that a copy of After Effects is a pre-requisite for working in the industry and so they buy the video package which includes AE and Premiere Pro, but they never open up the editor. Adobe has recently had an event in Hollywood called ‘Dances With Films’ where Premiere Pro was the editing platform of choice where FCP had always been favourite before. Out of the 13 editors that were taking part in the event eight of them had Premiere Pro on their machines but had never opened it, apparently these editors were very impressed with what they found. Perhaps since the Apple announcements there has been more virgin launching of an editor that up until now hadn’t been used at all. But it seems as if AVID are listening as well, a recent user group in LA showed a sneak peek of a new user interface. Avid’s Paul Foeckler also showed off the DNxHD codec working in 4:4:4 RGB. They also announced 64-bit support; the ability to work in larger than HD frame sizes, such as 2K, 4K and higher; and more third-party support video I/O from AJA, Blackmagic, Bluefish 4:4:4 and others for I/O solutions. Showing your hand with a new UI too must have been in response to the damp response FCP X got from the industry. Jason DeRose, one of Novacut’s founders and its lead developerSo where do editors go from here, well there is another option, the open source route. Everyone knows that Lightworks, the original NLE, is now owned by EditShare and is now a free open sourced product. Check their web site for their roadmap and progress which includes porting to OSX sometime this year. Their platform had a huge boost last year with the Oscar winning film The King’s Speech being cut by Tariq Anwar on Lightworks. The platform should gain hugely from that, but there is another open source editor that you may not have heard of, that is Novacut. Novacut has already been in development for a year and has been part of the Kickstarter project which attracts investors to fund further development. Tara Oldfield explains where Novacut is coming from: “We’re developing for pro video editors. During the next phase of development will be the UI design and implementation. We’re all about identifying how video editors naturally want to organise the stories they want to tell, as well as the unnecessary steps that their editing software of choice forces them to take. Once time suckages are identified, we’ll delve into iterating different designs for the same problem, employing usability testing throughout this process to find the most intuitive, user friendly design in the bunch. 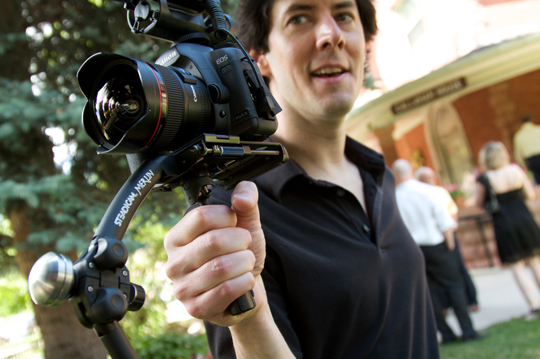 Novacut’s video editing software will be free of charge. Their business model is based on its distribution platform, not its editing software. Along with the video editor, they’re creating a central hub where artists can distribute their full length narrative features, web serials, animated shorts, documentaries, etc., while simultaneously crowd funding their work. Novacut will take a cut of the revenue artists make to pay developers, maintain their cloud, etc. Of course publicly traded companies allow continuous funding for editing products but Novacut with it’s ‘cloud computing’ philosophy may have turned up at the right time especially when so many people feel let down by their editor of choice. Because most people aren’t going to jump on to another editing platform in the middle of a job the shock waves from this turn in the editor’s story might not be felt until next year. But that is maybe forgetting that Apple might be stung in to action and turn this product around and put in all the things that they have taken out.